The first thing you’ll need to know for this is if the theme you’re currently using supports custom typography. If it does, you’ll see the available options under Appearance → Theme Options in your blog’s dashboard. 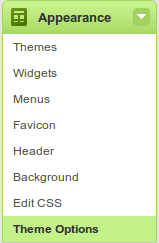 Don’t forget you can quickly search for themes with custom typography using the feature filter in the Themes section. If your theme does not support custom typography, you’ll be able to change the font-family or font size using the visual editor, when editing your posts. +–Can I change the style of my blog’s title / header? if the theme you’re currently using allows you to, go for it. Once again, you should see the option available under Appearance → Theme Options. If it doesn’t, try using a custom header image. +–I can’t see the menus in the visual editor! If you’re not seeing the font-family and font-size menus like the ones in the images above, use the Show / Hide Kitchen Sink button in the first row of your text editor, and an additional row will be displayed.